Hey there everyone! How are you today!? I have had a social media post idea for a very long time and I thought it was about time I just finally write it! So lets get to it! I am going to try and cover a lot of things in this post and tips in the social media world and kind of just give a back story on some recent things I thought would be interesting to share. Social media is so neat in my opinion! It brings people together from all over and really neat things can come of social media when using it correctly. Obviously there are always some not so great things that can come of social media, and there are a lot of people who don't like it. I can say I see both sides but for me I see the positives more than the negatives. 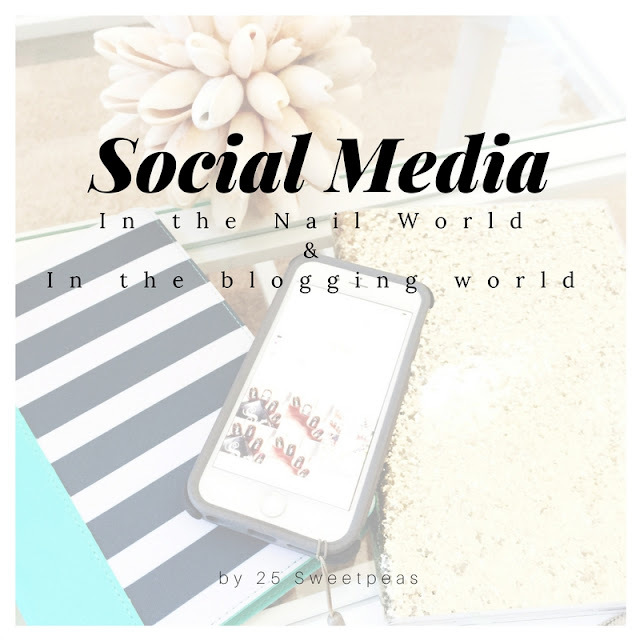 With out social media I would not be on my 3rd year of writing blog posts. I have social media to thank for helping me get to where I am today. I know that sounds cliche but its true. In 2012 I started an Instagram(IG) account. My first form of social media, and I loved it. I started it out with just nails every now and then, and started following all of the nail artists I could find. At that time Instagram was perfect! So much fun and I would always look forward to getting on there. In 2013 I started doing nails more avidly and started painting about every so many days. Skip to 2015 and I have posts up every other day, starting a blog and really taking the nail hobby to the next level. After opening my blog I then jumped on the Twitter, Facebook, and Pinterest (although I'm not sure I count that as a social media). 2015 was a great year for social media, things were great and even though I was doing all of those above listed sites at that time Instagram was my "home" and favorite social media outlet because it is where I started out. However come 2016 Instagram kind of lost its uniqueness. As most of you know a few years ago Facebook(FB) bought Instagram, which made a lot of people nervous. Thankfully though there were no changes at the start. Yet for the past 2 years or so that hasn't been the case. Instagram introduced ads, sponsored posts, videos, a new feed algorithm, and that new "story" thing that is similar to SnapChat. Some of those we have found to be good, like the videos, YAY for nail art tutorials, but others haven't been so great. I think the part that stands out the most to me was the algorithm change which changed how things appear in our feeds. 2015 was a great year for my Instagram and lots of others in the nail art world, and actually the beginning of 2016 was pretty decent, but then all of the sudden they changed things. I think I can speak for myself and many other nail art people by saying when this change happened we saw and felt the effects. Loss of engagement. Which was/is so sad. Also I know I follow people and I miss their posts often because they don't show in my feed due to the "algorithm". I knew this was the case through out last year but it was only really recently that I really saw a big indicator which is what sparked the idea for this post. So you know that #bestnineof2016 ? Well I went to check mine the other day so I could share with you all, however I found it to be very fishy. All of the manis that I saw were ones from the first few months of the year pre feed algorithm change. Which yes I guess those may of been the "most popular" however it was the most popular of when my posts were still showing in followers feeds. There were much better manis in the later part of the year and yet they weren't appearing. The average amount of likes decreased in the year and have been staying much lower than they previously was for the past so many years. I thought about it, and it wasn't the content of the posts because all of the posts were really well received by the few that did see it on IG and those that saw it in other outlets. Which all of that info points to the algorithm changes. Others have seen this same change as well. All of that being said Instagram will always be my starting place, and its a great place. However if you are using it and find its not the same anymore don't be discouraged. It may not be your content it may be the fact your posts aren't showing up in your followers feeds. Another place that has a similar issue is Facebook. Obviously your personal FB page is for friends and family. However most likely if you run a blog you probably have a FB Page for your blog as well. Now I just created mine in 2015 and I can tell that the FB page area is a very hard to advance in. You can have a ton of "Likes" on your page, or "followers" but if those people aren't actively actually liking your post with the thumbs up or heart or one of the others and they just keep scrolling then the next time you post, your post isn't likely to show up in that persons feed, despite the fact they follow you. (Keep that in mind if you are following someone yet not seeing their posts and wondering why) Again there may be nothing wrong with your content it may just be how they filter things to "tailor" your viewing experience. Since I run a page and can see how to do so I kind of have an idea why Facebook may do this. Now this is just my personal idea not official by any means but... When I log on it will show me some stats on the latest posts and often it will suggest "boosting" a post. It is basically paying to make sure your post isn't filtered out. It says for $5 I can boost a post and they will guarantee 350-920 people will see it. That just doesn't sit well with me. I mean you shouldn't have to pay to be "seen" I understand companies having sponsored posts, and ads and such but I don't think they should just take other posts out of peoples feeds once one has signed up to follow that person. There is just something really fishy about that. So once again, i'm starting to sound like a broken record, don't let low views on Facebook get you down. Now on to Twitter. I started twitter in 2015 right after opening my blog. It quickly became one of my favorite social media outlets, and I think it has stayed the most consistent honestly. Obviously it has changed over time but its actually changed more cosmetically and in how you use it. They did like all of the others and did come out with a filter thing for your "news feed" of what you follow but they did one major thing others didn't. They give you an option!!! Now yes that doesn't work if other people don't switch that little thing in settings but I think a lot use that because they already chose to follow said person in the pretense of wanting to see what that person posts. Which to me no matter what media you are on, if you follow a person to see what they post you should see that. If you didn't want it in your feed you wouldn't have followed or you could of just unfollowed. No one else should be like "Oh you don't need to see so and so's post today so we will skip that". Simple as that. Plus in Twitter I think that the hashtags are still very alive. I don't think they do anything in Facebook at least I have never benefited from them. Then as for Instagram they used to be a huge thing but I'm not so sure if they are of help anymore. Its really hard to tell, but I don't really notice a difference when using and not using them on IG anymore soooo.... As of right now I personally think Twitter is the place to be, and I find people are more likely to interact there which is nice. Now you are probably thinking what about Pinterest, and Snap Chat. I have gone back and fourth on including those two here. I LOVE both of those places so much but I am not sure I view them as being in the same category as IG, FB, and Twitter. Pinterest is amazing, addicting, and I LOVE it! So much inspiration, and yes you can post your own content and I do but I just don't view it the same way I do other social media sites. Its more of a pool of ideas and a great way to save ideas from others and add your own ideas for others to see. As for Snap Chat.... Well its just fun! I personally use it more for friends and family, but from time to time I use it to notify people of new posts, or news regarding my site. I do love to use it when I am out and about and showing you places around me or an #OOTD or makeup. Its more of a relaxed goofy social media in my opinion. Great post. I feel the same way about Instagram. I am so disheartening by the lack of engagement, the dwindling follower counts and the content I see, all thanks to the algorithm. It is just a shame. Especially since it was working so well before! Exactly, there was no need to "fix" something that wasn't broken! :( So very sad to see something that was so good go down hill.